Experts in sourcing Atlantic Cod and Salmon, Haddock, Lakefish, and a range of Specialty Products including Smoked Salmon, Bake & Broil Cod and Corvina. At Nordic Group, our mission is to provide our customers with outstanding products, maintain our passion for excellent service and to conduct all of our business dealings with honesty and integrity. When you make a commitment to purchase Nordic Group products, we make a commitment to supply them consistently, delivering the highest quality products when you need them. Since 1967, Nordic Group has been providing foodservice customers with frozen fish that meets their exacting specifications. In the beginning, our business was based on Norwegian sourcing and has since been expanded to include superior products from a range of global sources. Our parent company in Norway, Nordic Group AS, has continued to grow its business in Europe with Norwegian seafood, both fresh and frozen. The Nordic Group team has a passion to be the best in the industry and is dedicated to customer service. The lines of communication are always open between our customers and every team member. We will support you with information, product education and marketing assistance. Every order, every delivery and every contact are investments in the long-term success of our partnership with you. > Learn about our sourcing capabilities that offer foodservice operators a consistent supply of high quality frozen fish products. Our Norwegian roots are the foundation for business practices that value honesty, integrity, "straight talk" and excellent service. Nordic Group’s roots are in Norway. 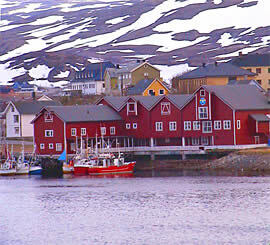 Our wild-caught Cod and Haddock come from the cold clean waters of the Barents Sea. Fjord Fresh Norwegian Atlantic Salmon are raised on farms along the coast of Norway.